Kalyn, from Kalyn’ s Kitchen, is hosting a weekly herb blogging event, where bloggers photograph and talk about the herbs and other edible things in their garden. It just happened that I was in the garden early this morning waving my camera around and being looked at suspiciously by the postman and the village’s early risers (most of whom were walking dogs. When I find out which of them owns the dog that keeps coming into my back garden, digging up bulbs and pooing in the hole, I shall…photograph it). The small, flat herb in the centre here is a lemon thyme. I grow several thymes, and this is my favourite; it’s very fragrant, and has a verbena edge which goes beautifully in a bouquet garni. I’ll be using some in a beef and Guinness casserole later this weekend. 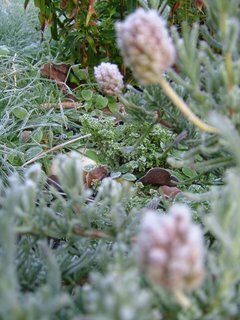 The lemon thyme is surrounded by a French lavender, which is flowering steadily, and has been since early summer. (Given the very hard frost last night, I suspect it’ll give up now.) 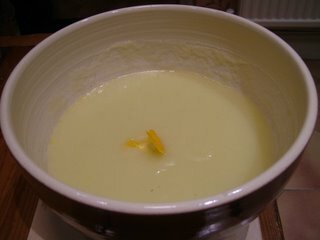 I use the flower heads and leaves in a lavender ice-cream which you’ll have to wait until next year to try. This is a fairly horrible photo when viewed this size; I was trying to be artistic. Must remember to stick to being mundane. These are the last of the rowan (mountain ash) berries. They make a very good jelly earlier in the season, when they are still hard, mixed with crab apples, but the house is currently groaning under the weight of dozens of jars of quince jelly, so I left them on the tree this year. An old wive’s tale says that plants near a mountain ash will fail to thrive, and often die. I do have some trouble planting around this tree, especially with plants like annual fuchsias, which aren’t all that hardy to start with. This year I’ve put in some wood anemone bulbs to flower early next year, and the hellebores under the tree do well too, so we’ll see how things are doing in the spring. Finally, the prickly wild English roses (Rosa Acidularis) in the garden, which smell so wonderful when they flower, are covered with bright haws at the moment. 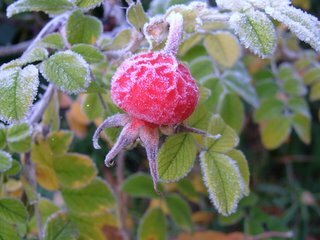 Rosehips can be used in an infusion, are used in a Chinese children’s sweet, make another excellent jelly, and can be used as a cooked dessert fruit once the white, hairy centres are removed. I deadhead all my roses to keep them flowering late into the summer and on into autumn, but this bush I leave alone to form its haws, which are as beautiful as flowers; red, fat and shiny, they decorate the bush for months. 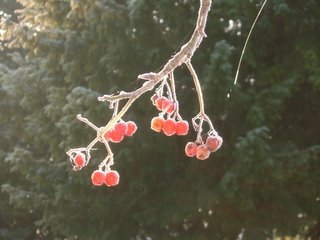 And don’t they look good in the frost? 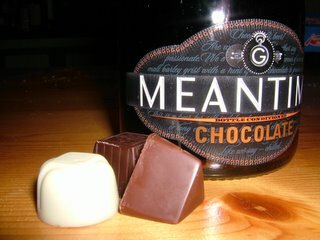 Meantime Chocolate Beer, from the Greenwich brewery, is, they say, specifically aimed at women, who, according to those marketing it, drink alcopops in preference to beer. Nonsense. Some of the best nights (and worst mornings) of my life have been courtesy of the Cambridge Beer Festival, where both Mr Weasel and I have ‘worked’ (I use the term advisedly) as staff in previous years. One of the things that swung the choosing of our present house for me was its handy location next to a real-ale freehouse with a fantastic restaurant (nothing like having your Fenland ale within staggering distance – those who email me and appear reasonably sane will be told where it is, but I’m not publishing its name here for fear of people breaking into the house to steal my cake). Beer and I have a glorious, long and ultimately pretty intimate relationship. Girlie beers are not for me. Or are they? A while ago, when Sainsbury’s started stocking Meantime Chocolate Beer, I thought I would try an experimental bottle of the stuff. Damn me if they haven’t come up with something grown-up, silky and both beery and chocolatey at the same time. I may be a real-ale bore, but this stuff, marketed to death and not out of a pump (it is, however, bottle-conditioned, which means that new beer and yeast is added to the finished beer in the bottle, making it finish its fermentation and develop fizz after the lid has been put on) is just magnificent. There’s not a hint of sweetness to it; any chocolate flavour is the smooth, dark, dry taste you get from a very high cocoa-mass chocolate and not overpowering, and it combines beautifully with this extremely malty, quietly hoppy beer to make something quite disturbingly drinkable. A note of vanilla ties the malt and chocolate together. This is definitely not a novelty beer. If you’re in Sainsbury’s, pick up a bottle; I think you’ll like it. Now, clearly, buying only one bottle of beer would be the action of someone who wasn’t thinking awfully hard. I was thinking hard. So I bought another. 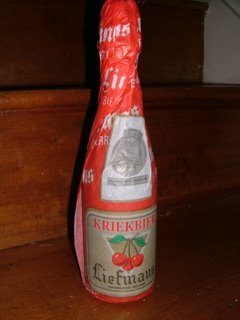 My second bottle was one of Liefmans‘ utterly gorgeous Kriek, or cherry beer, which comes wrapped in a pretty twizzle of printed paper. Perhaps I do like girlie beers. Liefmans Kriek is considered one of the very best cherry beers. (Kriek, by the way, is pronounced ‘Creek’, if ever you are in Belgium and struck with a terrible craving.) It’s an unexpectedly sour drink which almost makes your mouth pucker; tart and fruity, but rounded and terribly, terribly delicious. The beer is a deep, wine-red, with a pretty pink head. (No photograph in the glass, I’m afraid; I forgot to take one before I started drinking, and the glass has lipstick and fingerprints on it. Disaster.) It’s unfiltered and unsweetened (important, this; lots of cherry beer is sweetened, and it’s not anything like as good), and so full of cherries they almost dance in front of your eyes as you sip it. There’s a hint of almond, possibly from the cherry stones. It’s like a wonderful fruit juice. A wonderful fruit juice that makes you fall down and giggle. Yeast. This week it’s my number one microbe. 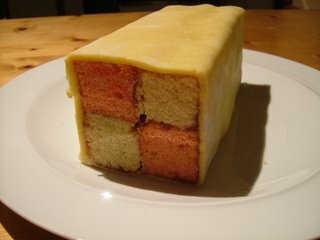 Battenberg is the spelling which is, in fact, correct; the cake is named for the (originally German) family who made up part of the British royal family, and eventually renamed themselves Mountbatten in World War I to distance themselves from Germany. 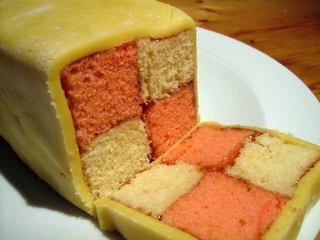 It’s not clear who first came up with it, but they must have been pleased with themselves; it looks impressive and tastes fabulous, if you’re one of those sensible people who likes marzipan. If you’re not, go and cook last week’s cake instead. Mary Berry beats the butter, sugar, eggs, ground rice, flour, baking powder and almond essence for two minutes until smooth, adds the colouring to on half and then cooks the two halves in the same low, wide tin. 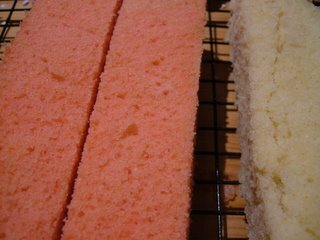 I’ve tried this before, and it’s almost impossible to get a reasonably neat line at the colour boundary, so I now use two separate loaf tins, which means you have to cook the cake a little longer than the 40 minutes she suggests (try 50 minutes and test with a skewer). One reasonably foolproof way to tell whether your cake is done is Mr Weasel’s Aural Method, where you get close to the cake and have a listen. An underdone cake will be making tiny, fizzy, popping noises. A cake which is cooked properly doesn’t pop or fizz. Don’t turn the cakes out until they have had some time to cool, or they will be crumbly. 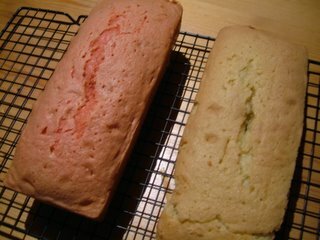 (I was a little too eager with the white half, which, as you can see from the picture, is – well – crumbly. It’s not the end of the world; you can glue any dreadful errors back on with jam. This cake is more forgiving than it looks.) Trim each of the two cakes into two cuboids, each with the same square cross-section, so that you can put them all together later. (Can you tell I’ve been working on editing some secondary school maths materials?) Warm your jam (if, like mine, it is a jam with pips, strain it after warming) in a saucepan until it is runny and spreadable, and assemble the cake in the traditional chequerboard pattern. Roll the marzipan into an oblong big enough to wrap the cake in. 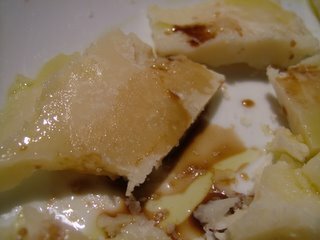 Slather some more jam on the now glued-together cake, and roll it all up in the marzipan, smoothing the join. Make criss-cross patterns on the top with a butter knife. It may not be quite as unnaturally regular as Mr Kipling’s version, but it’s just as unnaturally pink, even more unnaturally delicious, and will make your friends make the kind of unnatural noises they usually reserve for firework displays. 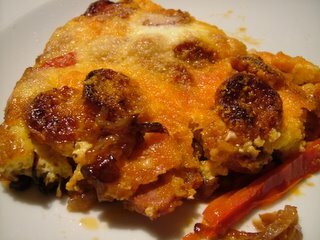 No apologies here, but this is not quite a Spanish omelette, or tortilla. It’s Span-ish – Spain filtered through my fridge contents. Melt the butter, and put the onions in the frying pan with a large pinch of salt over a medium heat. Now go and do something else, and don’t look at them again for twenty minutes. Give them a stir. Do something else for another twenty minutes; if your house is like mine, something somewhere is crying out for a duster. Stir again, and add the potato cubes. Surf the web for the next twenty minutes (you’ll find some interesting links on the right). Stir again, this time adding the peppers. 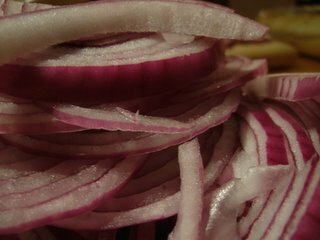 Your onions have been sauteeing now for an hour with a little salt, which has driven lots of the liquid out of them. They will have turned soft, brown and caramelised. They will be sweet and buttery. You will have trouble not eating them straight out of the pan; restrain yourself. Better things are on the way. Continue to saute, stirring now, for five minutes, or until the peppers have become soft. Spread the sliced chorizo evenly over the top of the pepper and onion mixure, and then pour over the beaten eggs, which you’ve grated some pepper into. Keep the pan on the heat until only the top is wet. Sprinkle over the parmesan, and then put under a medium grill until the egg has set and the cheese is turning brown. Gorgeous red juices will be leaking from the chorizo. Slice and serve with some salad and crusty bread. This tortilla is also absolutely wonderful served cold as part of a picnic. I had some very good moules marinere in Wimereux, a town in northern France, in September. Each tiny mussel (smaller than the mussels you might buy to cook at home) had a pea crab living inside its gills (you can see a very graphic video of one found in a mussel here), which, although admittedly mildly creepy on first encounter (Gah! There is a tiny thing in my mussel), made the whole mussel experience about twenty times better, adding flavour and, dare I say it, texture. 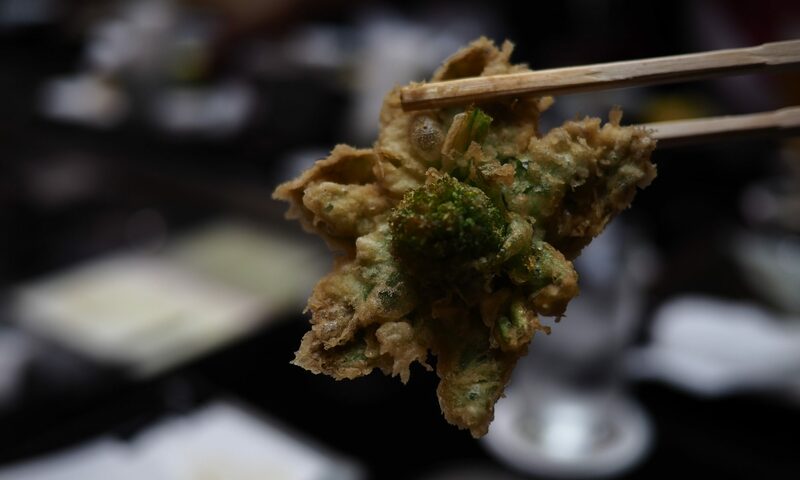 Lovely, leggy, crispy texture. 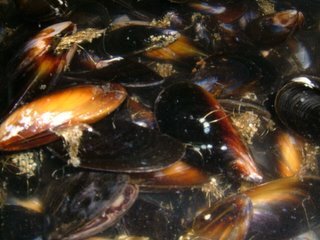 The mussels you can find at an English fishmonger will almost certainly be farmed, rope-grown mussels. This means that they’re not as gritty as wild mussels, but they’re also not as flavourful. On the other hand, though, you can really go to town with the flavours you cook them with, so it’s not a total dead loss. Mussels straight out of the plastic fishmongers’ net are rather unprepossessing. They’re slimy, they have a straw-like, tough ‘beard’ attached (you’re going to have to remove this later, so pay attention), and they offer a home to a myriad of exciting barnacles and other little friends. Some will be open; rap them on the working surface. If they’re alive, they’ll shut. If they’re cracked or dead (or feigning in the hope that you are on a quayside somewhere), they’ll sit there, inert, daring you to look them in the eye. Bin them. Run a sink of cold water, and drown the sad, live mussels. Give them a good scrub with a little brush, take the beards between your fingers, and yank them off. The larger the mussel, the harder you will have to yank. This beard is not, obviously, a beard, mussels having no weak chins to hide from lady mussels, but is a fibrous mass they grow to attach themselves securely to rocks (or in the case of these guys, ropes). When you pull it off, pull towards the shell’s hinge; you might tear apart the meat of the mussel pulling towards the open end, and this will kill them, prevent you from dealing them the unique, boiling-in-wine death you’re about to offer. The ones in the picture above are cleaned. They look a lot more appetising. 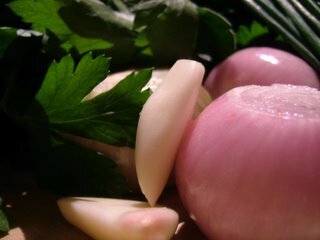 Soften the shallots and garlic with the thyme and bay leaves in the melted butter over a medium heat for five minutes. Turn up the heat, then add the wine and creme fraiche. 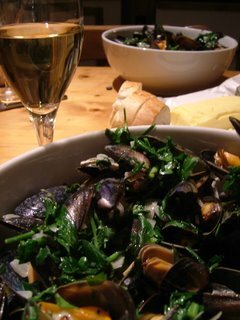 Simmer for five minutes to burn off the alcohol, and, while the wine mixture is bubbling, tip all the cleaned mussels in. Slam the lid on. 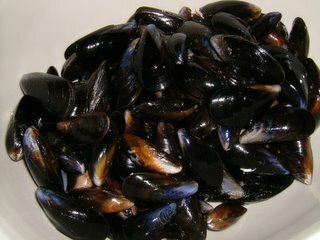 The mussels, already pretty grumpy that you’ve removed a useful body part, will expire in the steam, giving their salty juices to the sauce – you don’t need to add salt yourself. Keep the lid on for three minutes, then check the pan. Fish out as many as have opened as you can, and put them in a serving dish (I use large salad bowls – there’s a lot of shell in there). Put the lid back on and steam for three more minutes – they should now all be open. (Discard any closed ones; they were probably dead before you cooked them.) Take the mussels out, leaving the sauce in the pan. 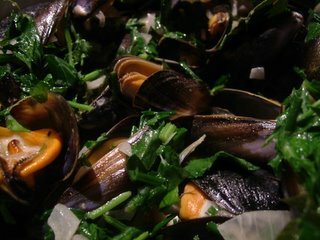 Stir the chives and parsley into the hot sauce, leave it for a minute to allow any sand or grit to settle (very unlikely, this, with rope-grown mussels) and spoon it over the open shells. Make sure you’ve got some good bread to dip in the buttery, juicy sauce, and use your fingers to pull the satiny little mussels from their shells. I usually end up naming some of my more recognisable mussels. Clint, the very big one with the nigh-unremovable beard, and Fifi, the teeny, beardless one with the barnacle beauty-spot, both died for my supper. It was a worthwhile sacrifice. Tonight, I feel like something Malaysian. Wandering around Tesco, I realise it’s my lucky day; one of my favourite cuts of meat in Chinese and Malaysian terms is pork belly, which is full of flavour (and full of fat – but where do you think that flavour comes from? 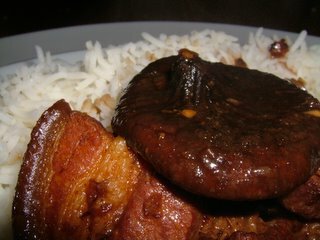 ), and which becomes sticky and rich when braised for a long time. (It also makes a wonderful, crackling roast, which I hope to explore in a later post.) Pork belly is not a remotely popular thing in the UK, and, absurdly, this very tasty cut is only £1.50 for 160 grams. I look around at the grim women pushing joyless trolleys full of chicken nuggets and frozen pizzas, and think unrepeatably uppity thoughts. There is nothing like a Friday evening spent simmering things that smell nice, and feeling smug. 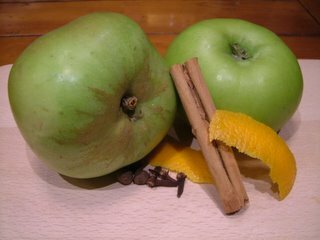 This dish uses cinnamon, which you may think of as a dessert spice. Try it with the meat in this recipe; you’ll add it at the beginning, in a paste with the onions and garlic, where it becomes beautifully aromatic. 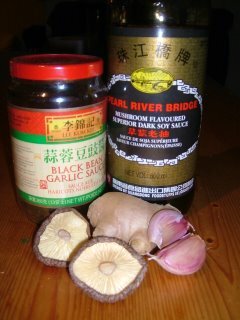 You’ll also need some black bean and garlic sauce, which is available in Chinese supermarkets, and a good five-spice powder. Chop the onion and garlic as fine as possible in a blender with the cinnamon. Heat the oil and fry the onion, garlic and cinnamon mixture until golden. Add the black bean sauce, the soya sauce, the five spice powder and sugar, and stir fry for two more minutes. Add the pork and ginger, with a glass of rice wine and enough water to barely cover it with the sauce ingredients. Stir well to mix and increase the heat under the wok to high. 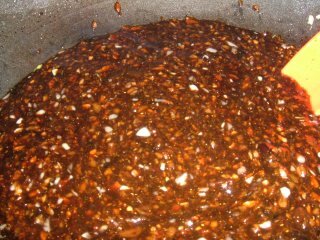 Boil the sauce briskly until it is thick and reduced (about fifteen minutes). Add more water (about a pint) and bring to a simmer. Add the soaked mushrooms and the spring onions. Lower the heat under the wok, cover it and simmer, stirring occasionally until the pork is meltingly tender (aim to be able to cut it without a knife). If you feel the sauce is too thick, add a little more water. Serve with rice. This is beautiful, glossy, and syrupy. If I were in Malaysia, I’d have put some sugar cane in there with the pork. Sadly, I’m in Cambridgeshire. Sugar cane is not really considered a commodity over here. I need a holiday somewhere where interesting things grow. It’s cold. It’s windy. When these conditions prevail, our bodies are programmed to do something rather special. They are programmed to crave stodge. One organism, the mushroom, does better than we do in the cold, leafy months. 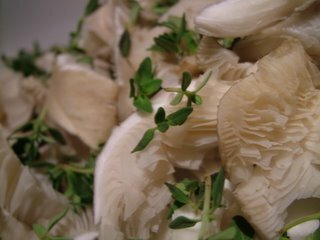 The supermarket shelves are overflowing with punnets upon punnets of mushrooms, and they’re quite reasonably priced. On top of this, almost everybody I know seems to have a cold at the moment, and I think some garlic, said to have a mild antibiotic effect, is in order. Stodge, mushrooms and garlic. This is a perfect excuse for some mushroom risotto. Carnaroli is my favourite risotto rice. It’s a fat, short grain which will absorb more than its own weight in stock, and cooks to a fluffy, swollen, creamy risotto. If you can find carnaroli rice, do try using it instead of arborio, which is more often sold as a risotto rice in supermarkets. I used shitake mushrooms (meaty, robust little beasts which keep a good, toothsome texture; they don’t melt to a slime) and oyster mushrooms (less good, honestly, but still pretty darn nice). I don’t wash them, but wipe them instead with kitchen towel so that they don’t absorb unwanted water. 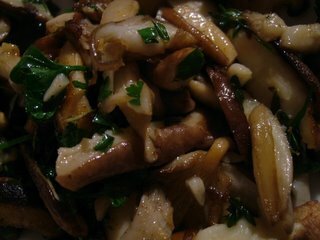 I fried all the mushrooms (including the cepes) with two of the cloves of garlic and half the thyme in a mixture of butter and olive oil, and when they were cooked, stirred in the parsley, squeezed over the lemon and sprinkled over a little salt and some cayenne pepper. While the mushrooms were frying, I made the risotto base. 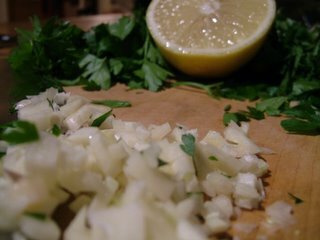 The celery, shallots, the rest of the garlic and the rest of the thyme were sauteed in oil and butter, and when soft the rice was added, and then fried gently, without changing colour, for a couple of minutes until transluscent. I added the marsala, and stirred until it was all absorbed. Then I added the soaking liquid from the cepes and stirred until that was all absorbed. The two pints of stock were then added a ladle at a time, each time stirring and stirring until all the liquid had gone before adding another ladle. 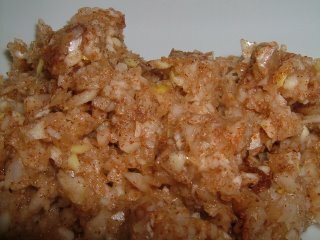 After about twenty minutes, the liquid was all absorbed, and the rice creamy and tender. I stirred in the mushrooms, cheese and creme fraiche. Serve this quickly, while it’s still hot and moist. 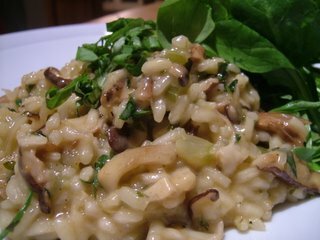 I have managed to convert at least one mushroom-hater with this risotto – try it yourself, and open your arms and welcome winter. Elizabeth David describes a Piedmont Pepper which I make quite frequently for a starter. It’s very easy – you halve a red pepper (sometimes you may find that cutting the pepper along the ribs which divide it naturally and dividing it into three or four instead works better for you, especially if you have a lot of people to feed), and place in it a slice of raw tomato, a slice of raw garlic, a piece of preserved anchovy as small as your little fingernail, a drizzle of olive oil and a little knob of butter. 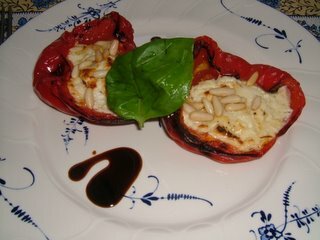 The whole lot is then baked in a medium oven until the peppers are soft and sweet (about 45 minutes). My Mum suggests augmenting this recipe with a disk of goats’ cheese cut from one of those logs you can buy in the supermarket, some toasted pine nuts and a drizzle of balsamic vinegar, which is what you can see in the picture. Lovely stuff – the salty, sharp cheese contrasts with the sweet peppers, and the texture of the pine nuts works beautifully with these soft ingredients. For once, I didn’t have to reduce the balsamic vinegar to get the consistency I needed for drizzling in a sweet, treacly swirl. My brother has recently spent six months living in Modena, and when our parents last visited him, they spent an awful lot of money on a minuscule bottle of balsamic vinegar which, aged in a barrel for 40 years, was considerably older than I am. It’s amazing stuff. Balsamic vinegar this old is a rare and precious thing. A true balsamic vinegar’s only ingredients are grapes – some cheaper varieties will add caramel for flavour, colour and texture, but a genuine bottle will only contain Trebbiano and Spergola grapes. The grapes are simmered over an open fire in copper cauldrons until they lose more than half their water content, and the resulting syrupy grape must is placed in wooden barrels with a starter of already-aged balsamic vinegar, which helps fermentation. The barrels are subject to strict controls; only oak, cherry, chestnut, mulberry, acacia, ash and juniper woods are approved for the aging process. The vinegar takes on deep flavour from the wood it’s stored in. A young balsamic vinegar is aged for three to five years – the oldest can be up to 150 years old. There is an ancient tradition of producing balsamic vinegar in Modena; the earliest reference to the vinegar was made in 1046AD, when a barrel was given as a precious gift to the King, later Emperor Enrico II of Franconia. Its gastronomic application hasn’t always been appreciated – balsamic vinegar pops up in historical texts as a panacea to be smeared on festering body-parts or drunk for sore throats and labour pains, and as an antiseptic. If you are lucky enough to come into possession of a good bottle of old balsamic vinegar, try drizzling a tiny amount on some thin slices of parmesan cheese I’ve added some truffle-infused olive oil here too) and eating with a glass of something red and robust. Dip a strawberry into a drop. Lean back, smile, and consider how blessed Emperor Enrico was, with his whole barrel of the stuff. At the weekend, my Dad cooked some roast pork (roast pork which he did not allow me to photograph, the shy man). 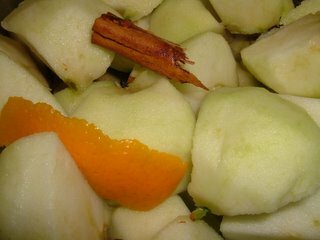 Now, clearly, nothing is better with roast pork than a good apple sauce, so I spent twenty minutes the previous evening making some so that it would have a night in the fridge to infuse with quiet background flavours from some spicing and orange peel. At this time of year the shops are full of handsome, enormous Bramley apples. They’re a cooking apple too tart to eat raw (my Grandma used to grow them, and I learned this to my cost), but when cooked they melt into a beautiful, pale, fruity mush. I peeled and chopped five apples (leaving the cores and seeds intact – there’s almondy flavour in those little seeds which emphasises the apple-ness of the sauce), and put them in a pan with half a wine glass of water, three whole allspice berries, four cloves, a stick of cinnamon, two and a half tablespoons of caster sugar and some pared orange peel. Fifteen minutes of simmering reduced the chunks to a fluffy mass. While the mixture was still warm, I beat in a large knob of butter and a pinch of salt. You only need a tiny bit of salt in this, and it doesn’t make the finished sauce at all salty, just underlining the flavour of the sauce. The mixture, still a bit rough and lumpy (and still full of spice and peel) sat on the side until cool, and then went into the fridge to develop overnight. The next morning, I pushed it through a sieve, making the texture silky and smooth, and getting rid of the spices (nothing is quite as surprising as an unexpected allspice berry cracked between your wisdom teeth). Allspice is a curiously English spice, popping up in all kinds of recipes from cake batters to treatments for game. It’s the dried berry of a variety of Jamaican myrtle, and was given its name by English explorers who believed that it combined the flavour of cloves, nutmeg, pepper and cinnamon. It doesn’t really; its flavour is very much its own, but in the UK a mixed, ground spice blend is sometimes used as a substitute. The finished sauce is not a thing of beauty, but it tasted extremely good; fruity with a glossy depth from the butter and spiced in a way that didn’t shout at you. Perhaps next time I’ll add a little dried chili and some grated fresh ginger. We glopped it all over my Dad’s excellent roast pork, and were happy. I lack a sweet tooth. Mr Weasel’s sweet tooth, however, is pointy, fang-like and preternaturally well-developed. 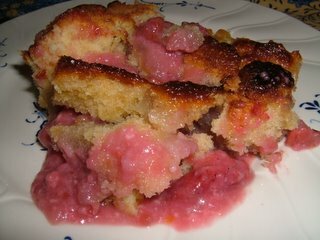 So while I slept in late at the weekend, he set about making Barb Schaller’s rhubarb custard cake. 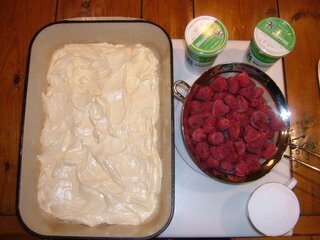 We didn’t have any rhubarb, so he fished some raspberries out of the freezer, and used them instead. I found this cake recipe on Usenet several years ago. It’s very easy, making use of (I’m going to hell) cake mix in a box, and is obscenely delicious, even for those of us who don’t usually go for pudding. springs back when lightly touched. 1-18 (depending on how you cut it!!) dee-vine servings. What on earth do they put in this cake mix? This Duncan Hines stuff is disturbingly good for something out of a packet. It’s almost . . . unnatural. Once beaten with butter and eggs using the hand mixer, it’s white and fluffy. 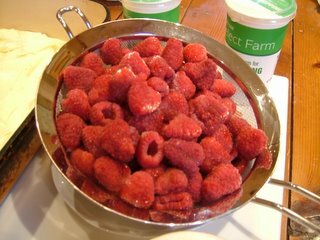 The raspberries are sprinkled on top, dusted with sugar, and the cream is poured over. Raspberries are more expensive than rhubarb (unless you’re growing them, of course), but my, this substitution is good – like your hair, it’s worth it. They’re sweet but tart, and the creamy custard is a perfect companion for them. Stock up when they’re in season; they freeze well. I usually find that the mixture needs cooking for a little longer (ten minutes or so) than the recipe states. It’s easy to test with a skewer, which should come out clean when pushed through the mix (if a bit raspberry-coloured at the end). The top of the cake cracks and becomes a golden crust, with an occasional spurt of pink custard bubbling through. The smell is, as Barb says, dee-vine. We leave the cake on the side for half an hour to cool until it’s warm and buttery, and dig in. I think I’m developing a sweet tooth.